São Tomé and Príncipe officially the Democratic Republic of São Tomé and Príncipe, is a Portuguese-speaking island nation in the Gulf of Guinea, off the western equatorial coast of Central Africa. It consists of two archipelagos around the two main islands: São Tomé and Príncipe, located about 140 kilometres (87 mi) apart and about 250 and 225 kilometres (155 and 140 mi), respectively, off the northwestern coast of Gabon. Both islands are part of an extinct volcanic mountain range. 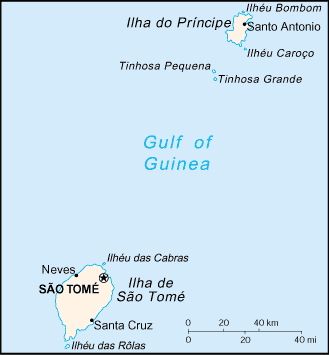 São Tomé, the sizable southern island, is situated just north of the equator. It was named in honour of Saint Thomas by Portuguese explorers who arrived at the island on his feast day. With a population of 163,000 (2010), São Tomé and Príncipe is the second-smallest African country (Seychelles is the smallest African country). It is also the smallest Portuguese-speaking country.